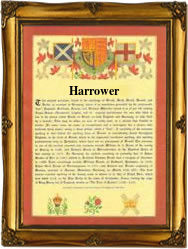 This surname recorded in the spellings of Harrower, Harower, Harrowing and Harrowin, is probably of Olde English pre 7th century origins. It can be either locational to describe a person from a place called Harrow, of which there are at least three examples in England, or it can be job descriptive for an early agricultural contractor, one who undertakes the harrowing of the furrows. It is also possible that the name could be tribal. In which case it would describe one of the 'Harrow' people. If this is the case the surname may well be a variant form of Harring(ton), translating as the 'tribe who lived on the heather covered ground'. The village of 'Harrow on the Hill' in Middlesex, is first recorded as early as 767 a.d. when the spelling is given as 'Gumingae hergae', or the 'heathen temple of the Gumeninga tribe'. By the time that the Domesday Book was compiled in 1086 this had shrunk to the modest 'Herges'. The village does not seem to have adopted the modern spelling until at least the 15th century. Early examples of the surname recordings taken from church registers include Robert Harrower of Holborn, on July 2nd 1778, Ann Harrowing who married George Atmore at St Botolphs Bishopgate, on October 30th 1796, and Elizabeth Harrowin, who married George Hogg on January 15th 1815 at St James Garlickhythe, London. The first recorded spelling of the family name is shown to be that of James Herrewin, which was dated August 8th 1618, christened at St Dunstans in the East, Stepney, during the reign of King James 1st of England and V1 of Scotland, 1603 - 1625. Surnames became necessary when governments introduced personal taxation. In England this was known as Poll Tax. Throughout the centuries, surnames in every country have continued to "develop" often leading to astonishing variants of the original spelling.